Strona główna » Blog » Program » Filip Taterka to join the Invited Speaker’s pyramid! It’s been a while since you’ve heard from the Literature Section, hasn’t it? It’s time to break the silence and announce the first literary Invited Speaker! 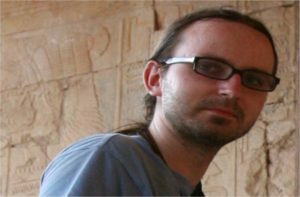 It’s Filip Taterka – egyptologist from Poznań. When it comes to legibility, ancient egyptian script can be found somewhere in the vicinity of prescriptions from your family doctors. However, this does not mean you cannot learn it at all. Filip Taterka is a living example of the fact that you can. He has been exploring mysterious texts for years, with the persistence of the explorers of labyrinths in the pyramids, the only difference being that instead of a torch, he uses a computer to do it. As a result of his research, a book was written entitled Opowieści znad Nilu: Opowiadania egipskie z okresu Średniego Państwa” (“The Nile Tales. Egyptian stories from the Middle Kingdom of Egypt”). This year he will share what he learned and talk about his passion to the participants of Pyrkon as part of the Literature Section, transforming the lecture room into the King’s Chambers in the Great Pyramid of Giza (the Pyramid of Cheops). Our Speaker also manages to read something in the common language at times. His favourite genres are fantasy, thrillers and historical books, however he is open to trying other types of literature as well.